More than a century ago, music began pouring into Memphis, Tennessee. Musician's of all races and backgrounds came together for the love of music,and created a rhythm and blues sound that changed the cultural complexion of the world forever. America's music exploded out of Memphis and today, the Memphis Music Hall of Fame honors many of the greatest musicians of all-time, who created this city's musical legacy and shook our planet to the core! What simply began as a tribute to some of Memphis's legendary and most creative musicians has finally opened as a museum that is as outrageous as our inductees. 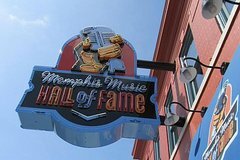 The Memphis Music Hall of Fame will introduce guests to some of the greatest musicians of our era, each of them responsibly for shaping modern music and changing the world forever right here in Memphis! You will experience never before seen memorabilia, rare video performances and interviews, interactive exhibits and so much more.